British architect David Chipperfield is either blazing a restoration trail or sabotaging old buildings, depending on which Berliner you listen to. 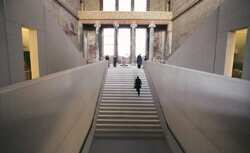 He is rebuilding a part of Germany’s equivalent of the Louvre—the war-damaged Museum Island complex. Chipperfield’s project, the Neues Museum, is the third of five museums to be renovated, and will house Berlin’s Egyptian collection, including the 14th Century BC bust of Queen Nefertiti. It will cost $329 million (Rs1,306 crore) to complete and won’t open until 2009. Built between 1841 and 1859, the Neues Museum was missing a complete wing as well as a courtyard, a corner and the stairwell at the centre. The bomb-struck, burned-out staircase of Friedrich August Stueler’s original is now replaced by an imposing, sleek concrete-and-marble model. Above is a dark wood roof and the walls are constructed of pale, bare bricks salvaged from demolition sites around Berlin that combine with patches of the old brickwork. Chipperfield’s contribution to Museum Island—a Unesco world heritage site— has incensed those he describes as “fundamentalist restorers." Annette Ahme, who started a petition campaign called “Save Museum Island," argues that Chipperfield has made preserving war damage his priority. “It’s much worse than I expected," Ahme said after viewing the museum. “I am horrified." In the atrium, the architects have avoided replicating a gold star pattern on the ceiling, leaving panels clean and drawing the eye to the original work. Where paintwork has peeled and flaked away, restorers are filling in the gaps in a lighter shade, leaving it instantly clear what survived and what didn’t. Frescoes have been cleaned, yet not completed, creating a collage effect. Helga Stutenbecker is a board member of the Gesellschaft Historisches Berlin, or Society for a Historic Berlin, which campaigns for the centre of Berlin to be restored as exactly as possible to its pre-war state. She said she isn’t happy with the “huge monster" of a staircase “that recalls the work of Albert Speer," Hitler’s favourite architect. Stutenbecker also objects to the reconstruction of one facade of the museum, saying it has “disturbed the symmetry." Yet the campaigners are losing their battle and Chipperfield is winning over Berlin’s cultural establishment. Ahme was forced to give up an attempt to petition for a referendum because she couldn’t get enough signatures. The completion date for Museum Island is 2015 and the last museum to be restored will be the Pergamon. The museums will be linked by a pedestrian tunnel and Chipperfield is designing an entrance building to accommodate shops and other tourist facilities. The most recent museum to reach completion, the neo-baroque Bode, was returned to its former Wilhelmine splendour by architects Heinz Tesar of Vienna and Christoph Fischer of Berlin, who recreated it to look as it did when first built.